BedInABox Buyer's Guide 2019: Which One Is Right For You? Home » Mattress » BedInABox Buyer’s Guide 2019: Which Of These Memory Foam Mattresses Is Right For You? BedInABox Buyer’s Guide 2019: Which Of These Memory Foam Mattresses Is Right For You? Made in the USA with a great warranty and sleep trial period, BedInABox offers competitive memory foam mattresses that are getting some good feedback. But which BedInABox mattress is best suited to you and how do you pick the right one? We'll help you out with this BedInABox buyer's guide to everything you need to know. Our top pick from the BedInABox range is the Serenity mattress, the brand’s top-of-the-line option. A high quality, plush mattress with a number of innovative cooling and contouring features, this mattresses offers ultimate comfort to suit all sleepers. Our second pick is the PacBed Original, the most popular model from BedInABox. This medium firm mattress has no-frills but offers a strong all-rounder contender to suit most sleep preferences. BedInABox offers a number of gel memory foam mattresses to suit different sleep preferences and budgets. Made in the USA with a 20-year warranty and a 120-night sleep trial period, you can choose between a variety of models – from a lightweight, affordable 9-inch mattress, to a luxurious 14-inch mattress with a number of innovative premium features. Below, we’ve reviewed our top picks of the various models offered by BedInABox, including their biggest strengths and weaknesses, so you can make a more informed decision on which mattress from this brand is best for your needs. The Serenity mattress is BedInABox’s premium model, offering a luxurious memory foam mattress with a ‘cloud-like’ feel and contouring support. Measuring 14-inches high and with a soft feel, this mattress is described as being ideal for all sleep styles and includes phase-changing technology that helps keep you cool when you’re hot and warm when you’re cold. For an ultra-luxurious memory foam mattress with all the frills, the Serenity mattress is our top pick for ultimate comfort. The 14-inch Serenity mattress is constructed from five layers and can be flipped to suit your preferences: on one side, it has a plush, soft feel, and the other side has a firmer feel that may be more suitable to stomach sleepers. The top layer consists of a 2-inch thick quilted cover made from soft, gel-infused CoolRest Adaptive foam, designed to provide contouring comfort and pressure relief. This CoolRest Adaptive material is made with microscopic capsules that are embedded into the cover that absorb and release heat for improved body temperature regulation. This phase-changing material is designed to adapt to your needs, helping you stay cool when it’s warm and warm when it’s cold outside. The next two layers of comfort foam are designed to provide a cooler sleep surface and pressure relief to the hips, back, neck, and shoulders. The first layer is a 1-inch thick layer of CoolRest gel memory foam that shapes to your body as you sleep, distributing your body weight for optimum pressure point relief. Next is a 2-inch thick layer of AirRest Adaptive foam, which uses air pockets to provide added support in the lumbar area and relieve pressure on the body. The bottom two layers work with the other foam layers to provide contouring support: a 4-inch high-density foam layer and 4 inches of high-density Sure Align support foam that helps to distribute your body weight more evenly across the mattress for better spinal alignment. The Serenity mattress is described as having a soft feel with innovative memory foam that will contour and cradle your body in any sleep position. For this reason, the mattress is described as being suitable for back, stomach, and side sleepers. However, the Serenity mattress can also be flipped for a firmer feel on the other side, which may be better suited to those who prefer to sleep on their stomach. One of the Serenity mattresses most innovative features is the CoolRest Adaptive material used in the quilted top cover. The microscopic capsules, based on technology that was developed initially for use in astronaut space suits, work by absorbing, storing, and releasing heat for an innovative solution to temperature regulation. This phase-changing material regulates body temperature by not only pulling heat from your body for a cooler sleep surface, but it can also add heat when you’re cold, creating the ideal sleep environment for you. While the Serenity is largely well-reviewed, some user reviews do comment that they found the mattress to be too soft to support their weight. If you know you tend to sleep better on a firmer surface, you might want to consider flipping the mattress or opting for a firmer model from BedInABox, such as the Tranquilium. This is the most expensive mattress in the BedInABox range, but it has the premium features to reflect its higher price. For a luxury mattress that promises to provide a comfortable, supportive, and cooling night’s sleep for most sleep preferences and styles, investing in this high-quality mattress is a good option. The PacBed Original mattress is the most popular model from BedInABox, providing a supportive yet soft memory foam mattress with a medium firmness level. This 11-inch mattress features CoolRest memory foam for contouring, cooling support and has a soft, breathable cover for a comfortable sleep surface. Designed to accommodate back, stomach, and side sleepers, the popular PacBed Original is a great all-rounder, offering affordable comfort and support as you sleep. The PacBed Original is 11-inches in height and is constructed from two memory foam layers, all made in the USA. The top layer consists of 3 inches of CoolRest gel-infused memory foam, providing contouring comfort that relieves pressure from your body as you sleep. The open-cell structure of this foam layer increases airflow through the mattress and out the breathable cover, providing a cooler sleep surface and a more comfortable experience. In addition, the CoolRest technology is designed to help reduce tossing and turning for less motion transfer between you and your partner, helping to provide an uninterrupted night’s sleep. Underneath is a support layer: 8 inches of Sure Align support foam provides a supportive base that distributes your body weight evenly across the mattress for long-lasting comfort and neutral spinal alignment. This layer has a 2.2-lb density, making it more durable than traditional memory foam to ensure the mattress lasts longer. The PacBed Original has a soft yet durable polyester knit cover, designed to stretch to accommodate the contouring properties of the memory foam. The breathable qualities of polyester are meant to provide a cool and comfortable sleep surface, allowing the gel-infused memory foam underneath to circulate air through the mattress and regulate your body temperature through the night. The PacBed Original has a medium firmness level, making it a good all-around fit for most back, stomach, side, and combination sleepers. Some user reviews report finding the mattress too firm, however, but you do get a 120-night sleep trial to fully test your mattress before deciding if it is the right fit for you. Overall, this is a good quality, affordable mattress that offers great value for money. It doesn’t have the same advanced cooling features as the more premium models from BedInABox, but it’s our top choice for an all-rounder that should provide a comfortable sleep surface to suit most people. The PacBed Lite is the most affordable model from BedInABox, offering a lightweight design and contouring, cooling support. At 9 inches in height, this medium-firm mattress may not be as durable as the other models in the BedInABox range, but it nevertheless offers good value for money in a supportive memory foam mattress with a medium-firm feel, suitable for all sleep positions. 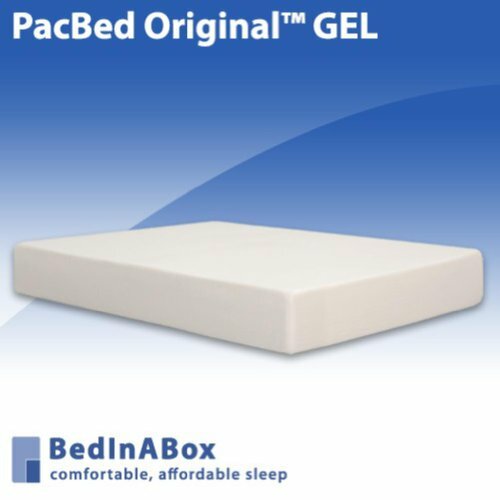 The PacBed Lite also features signature BedInABox CoolRest® gel-infused memory foam for excellent body support with increased airflow for a cooler sleep. The 9-inch PacBed Lite mattress has a 3-inch thick top layer of CoolRest gel-infused memory foam, designed to contour to your body for improved pressure relief to help you stop tossing and turning in your sleep. Constructed with an open cell structure, the gel-infused memory foam not only provides a supportive surface that hugs your body for improved spinal alignment, it also helps air flow through the mattress easier for a cooler sleep surface. This layer of memory foam is then supported by a 6-inch layer of support foam, designed to provide consistent support for improved spinal alignment, comfort, and an even distribution of body weight. The PacBed Lite is described as having a medium-firm feel with sufficient support and comfort to make it suitable for back, stomach, and side sleepers. However, some user reviews suggest that the mattress is actually too soft, so those who prefer a firmer feel may not find this mattress suitable, especially if you are larger or carrying some extra weight. Likewise, the lightweight design of this mattress is what gives it its more affordable price tag, but the 9-inch thickness may mean this mattress is not durable enough for long-term use, especially for plus-size sleepers who need additional support throughout the night. The PacBed Lite mattress is wrapped in a soft polyester knit cover, made to work with the memory foam for the perfect balance of comfort and stretch. Polyester is a breathable material, providing a cooling sleep surface to work in tandem with the CoolRest memory foam underneath. In addition, the polyester cover provides a quick-drying surface that is extremely durable, helping to ensure your mattress stays looking like new for as long as possible. Some user reviews suggest that this mattress is overly soft with weak edge support, so while it is designed to help reduce motion transfer, some users may still find themselves disturbed by their partner’s movements or lacking sufficient support throughout the night. Likewise, the leanness of this mattress makes it great value for money, but could reduce the durability of the mattress and looking at the slightly more expensive 11-inch PacBed model may be a better option. Still, if you’re looking for a no-frills budget option for occasional use, especially in a guest room, this might be a solid pick. The Tranquilium is an 11-inch high mattress designed to provide contouring support and comfort with cooling technology for a restorative night’s sleep – ideal for those with an active lifestyle. Featuring Tencel performance fabric and advanced CoolRest memory foam, this mattress is designed to provide a cool, breathable sleep surface with the contouring feel of memory foam. The Tranquilium is described as having a firm feel and is BedInABox’s firmest mattress. The Tranquilium mattress is 11-inches thick, constructed from two layers of memory foam to provide a firm and supportive feel, ideal for back, stomach, and side sleepers – although some side sleepers may find the mattress too hard to be comfortable. The top layer is 3 inches of CoolRest gel-infused memory foam with an open-cell structure that increases airflow for a cooler sleep surface. The gel-infused foam is designed to contour to your body and relieve pressure points for neutral spinal alignment and reduced motion transfer, so you can move freely without disturbing your partner. Underneath is an 8-inch layer of 2.4-lb density SureAlign foam to provide added support and alignment for longer-lasting comfort. This layer also helps to distribute your body weight evenly across the mattress for better motion isolation and to relieve pressure on your hips and back. BedInABox described the Tranquilium as having a firm feel that is suitable for back, stomach, and side sleepers. However, being the firmest mattress in the whole range, side sleepers may find this mattress too hard to be comfortable, especially if they are smaller or lightweight and might want to opt for a softer option, like the Azul or Serenity mattress. The Tranquilium mattress has a Tencel cover, which is a performance fabric that can absorb up to 50 percent more moisture than cotton and has an ultra-soft feel, perfect for sensitive skin. Tencel is highly effective at inhibiting bacterial growth through rapid moisture absorption and naturally creates a cool, comfortable sleeping environment. BedInABox is generally reviewed as having weaker edge support than some of their competitors, but the firmness of this mattress should help to provide a supportive surface with minimal motion transfer. The brand recommends placing your mattress on a flat and sturdy, non-spring foundation for the best results, although it is also suitable for use with an adjustable base. Overall, the cooling properties of the memory foam and Tencel cover combined with the firm, supportive feel of the Tranquilium mattress make it ideal for those with a more active lifestyle in need of uninterrupted, restorative sleep. For a mattress that contours to your body for better spinal alignment, pressure point relief, and minimum motion transfer when sharing with a partner, this model is a good option. The Azul mattress combines the brand’s most premium mattress – the Serenity – with their classic design – the PacBed Original – to create an affordable mattress with advanced memory foam and improved temperature regulation. At 11 inches in height, this mattress is described as having a medium-soft feel – ideal for side, back, and stomach sleepers. One of the most notable features included in the Azul is BedInABox’s CoolRest Adaptive technology, which balances the mattresses temperature with that of the sleeper. The 11-inch high Azul mattress is constructed from three layers of memory foam: a comfort layer, a transitional layer, and a support layer. The top layer consists of 3 inches of CoolRest gel-infused memory foam to provide pressure relief and reduced motion transfer when moving around at night. This layer is 3.25-lb with a quick response time, meaning you can change positions easier throughout the night with less of the ‘sinking’ sensation memory foam can often create. The CoolRest gel-infused memory foam is manufactured with an open-cell structure to enable air to flow through the mattress easier, creating a cooler sleep surface. The second layer is constructed from 3 inches of 1.8-lb density foam, designed to support the body, particularly in the lumbar region, while still providing additional cushioning and contouring comfort to the body as you sleep. The final bottom layer consists of 5 inches of high-density Sure Align foam to provide additional support and spinal alignment by distributing your weight evenly across the mattress. Overall, the Azul mattress has a medium-soft feel that contours to the shape of your body as you sleep and should be comfortable for most sleep preferences and positions. The Azul mattress has a polyester knit cover with CoolRest Adaptive phase-changing microscopic capsules embedded into the memory foam underneath. The nature of the polyester means that the cooling benefits of the phase-changing material underneath can easily come through the cover, providing a breathable sleep surface that regulates your body temperature as you sleep. This material works by absorbing heat from your body and dissipating it through the mattress for a cooler night’s sleep and it can also add warmth to your body when you are cooler. Overall, the Azul is a great option if you tend to sleep hot but don’t want the plushness that comes with the cooling technology in the Serenity mattress. The medium-soft Azul mattress should provide a comfortable, supportive night’s sleep for all sleep preferences, particularly those who tend to overheat on traditional memory foam mattresses. Every BedInABox mattress comes with a 120-night sleep trial period, allowing you to fully make sure your mattress is suitable before you commit to it. However, BedInABox does require that you wait 60 days before you can initiate the return process, which can be frustrating if you decide the mattress is not right for you much sooner than that 60 day period. All BedInABox mattresses come with a 20-year warranty with the exception of the PacBed Lite mattress, which comes with a 10-year warranty. The warranty covers the deterioration of the memory foam cell structure that causes an indentation in the mattress, as well as manufacturer defects. The warranty is, in our opinion, a testament to the brand’s faith in the longevity of their mattresses. All BedInABox foams are made in the US and are CertiPUR-US certified, which means they are not made with any harmful chemicals, such as mercury, phthalates, formaldehyde, or ozone depleters. BedInABox state that they have no weight limits on their mattresses because of the high-quality support foam they use in all models. However, plus size sleepers may find softer models, such as the Serenity and Azul, lacking in adequate support, so make sure you find a mattress with a suitable level of firmness for your needs. One of the areas where BedInABox ratings suffer is edge support, with many user reviews suggesting that the mattresses do not perform well in this area. That being said, edge support tends to be an issue with all-foam mattresses, so if you are a heavier person who prefers to sleep on the edge of your bed, you might want to keep this in mind. All BedInABox mattresses are available in sizes Twin through to Cal-King, with a Split King option available for adjustable bases, too. In addition, the memory foam mattresses are all fairly lightweight with the Queen-size Serenity mattress weighing 101 pounds and the PacBed Lite Queen-size mattress weighing as little as 51 pounds. The mattresses should, therefore, be fairly easy to manoeuvre into position once delivered to your door. BedInABox offers free shipping anywhere in the US. BedInABox mattresses are, as the name suggests, delivered compressed and boxed. The mattress must be unboxed within 30 days of being delivered to avoid voiding your warranty. Overall, BedInABox offers a number of great value for money memory foam mattresses to suit a wide range of budgets and requirements. They are generally very well reviewed, with the biggest negative being that some users find their mattress too firm. With that said, the 120-night sleep trial included with every purchase easily allows you to test your mattress before you need to commit to it long-term. We hope this guide has helped you in your decision-making process if you are considering buying a BedInABox mattress. Lucid Mattress Review 2019: Which Lucid Memory Foam Mattress Should You Buy? PrevPreviousGhostBed Ghost Pillow Review 2019: Is This The Perfect Memory Foam Pillow?